Healthy gums are vital for a healthy mouth and a brilliant smile. I worry much more about gum disease than tooth decay. You can have healthy teeth, but if you have a gum problem, the gums get detached from the teeth and the teeth become mobile. Your teeth may be healthy but they will all start falling out if your gums are diseased. Healthy gums show a healthy body and lifestyle. Your gums absorb nutrients and water into the blood stream, but if they are inflamed and bleeding, then the bacteria that enters through our mouths goes via the gums into the bloodstream and settles on heart valves and hardens arteries. This is a direct cause of heart disease and stroke. When we breathe there is bacteria in the air and when we eat there is bacteria on food. 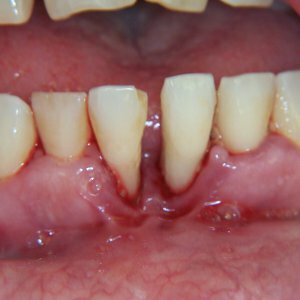 Under normal circumstances the bacteria goes to our stomach and the stomach acids kill them….. but if our gums are swollen, inflamed and bleeding….them the bacteria goes in between the gums and teeth and into the bloodstream causing further disease. A sign that this is occuring in your mouth would be a bad taste and I assure you that if you have a bad taste, automatically there is a bad smell. Do not neglect this…..not even your best friend will tell you that you have bad breath…..youll know by breathing into your hand and smelling your own breath……gives you a really good indication if this is the case or not. If so do not go to sleep before you have booked an appointment with your dental hygienist…..there is a solution. This problem is so absolutely reversible…….but its important to not ignore it and let it get progressively worse. Cleaning your teeth and gums professionally will go a long way to reversing the problem and there are treatments that will take away the bad smell permanently. Most mouth rinses just mask the bad smell. We have a treatment that will take it away permantly. By targeting the bacteria that causes this we are able to kill the anaerobic bacteria that thrive underneath the gums and within a week your problem is no more. You shouldn’t have to worry about something that is so easily reversed by just booking an appointment at your dentist. You will leave with sweet breath that will be long lasting. We have the product that helps and the correct cleaning method to put your back on the right path of good health. Regular visits to your Oral Hygienist will resolve the problem before it becomes more serious. Green tea, Aloe vera, Tea-tree oil…..are all natural antibacterial that target this problem. We have a product that comes from the USA……that includes all these ingredients and its is oxygenated…..doesnt have alcohol. Its used by the Movie Stars in California before the kissing scenes. Sounds funny, but it stops them complaining about kissing someone with bad breath. It also combats that horrible morning breath smell by using it the night before. Believe me there is help…..you just need to make the time to come see us. Please would a consultant kindly contact me. I would like to inquire more about the teeth whitening for myself and my fiance for our wedding in December.